Lesley Harrison was born to love animals. As the artist says, “It seems to be in my blood.” With a perpetual collection of everything from cats to chickens, the budding artist started drawing animals in grade school. This passion sometimes led to trips to the principal’s office when drawing took the place of paying attention to the teacher. After trying other mediums, Harrison picked up a stick of pastel in the mid-70s, and she knew this was her love. As the artist talked with galleries about representing her work, when it was learned she worked in pastels, many galleries were hesitant to carry her art. Using a new tact, the artist told a gallery owner that she worked in oil and pastel (which was true). The gallery owner asked that Harrison bring in the oils, but not the pastels. Making a wise decision, the artist took both kinds of works and left them for review. They loved the pastels! Harrison works on location and also uses reference photographs. This approach allows her to develop paintings that are fresh yet rendered with authority. 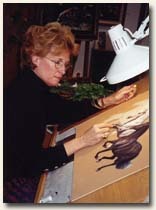 The artist has received various honors and awards for her technical excellence in pastels, which are considered very difficult to master. The Pastel Society of the West Coast has recognized Harrison for three consecutive years for her contributions to pastel as an artistic medium. She is also a member of the exclusive Pastel Society of America. Harrison combines her love of animals with painting and creates remarkable animal portraits. An affinity for the animals she paints and a strong command of her medium allow the artist to capture the spirit of each animal. This passion conveys to the viewer the animal’s individuality, grace, and strength. Harrison’s art is highly sought by collectors around the world. She has exhibited at the Leigh Yawkey Woodson Art Museum, the Pacific Rim Wildlife Show, and the Kentucky Derby Museum to name a few venues. The Friends of the Sea Otter organization commissioned an original work of art to be reproduced as a limited edition print for a national fund-raising promotion. The artist has been featured in numerous publications such as The Equine Image, The Artist Magazine, Art of the West, US Art Magazine, Wildlife Art News, and others. If you love animals and their world, join Lesley Harrison on a marvelous journey….the natural world and its many wondrous creatures await you.